Buy Tramadol 50mg Online. Licenced UK Pharmacy. No prescription. TRAMADOL IS ONLY AVAILABLE TO PERSONS REGISTERED PRIOR TO 01/01/2018. TRAMADOL IS NOT DISPENSED TO UK RESIDENTS. UK PHARMACIES DO NOT PROVIDE TRAMADOL. 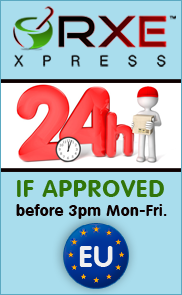 TRAMADOL IS DISPENSED BY AN EU REGISTERED PHARMACY ONLY TO NON-UK RESIDENTS. TRAMADOL IS ALSO AVAILABLE AT RXEUROPA.COM WHERE USERS REGISTERED PRIOR TO 01/01/2018 CAN LOGIN WITH THE SAME ACCOUNT CREDENTIALS. REGISTERED CUSTOMERS – NON UK RESIDENTS ONLY. Tramadol belongs to a group of medications called synthetic opioids. Tramadol mimics the effects of opioids by modifying the body’s response to pain. Before you can buy tramadol, you will need to complete a consultation for review by our doctors. We list below the tramadol treatments currently available through our clinic. Tramadol 50mg contains tramadol hydrochloride in a convenient tablet form. This prescription painkiller is commonly prescribed for moderately severe pain. Tramadol is available in a number of formulations and information on some of these products is provided below. PLEASE NOTE: THE PHARMACY ONLY PROVIDES TRAMADOL 50mg. THESE PRODUCTS BELOW ARE NOT AVAILABLE AND ARE LISTED HERE FOR INFORMATIONAL PURPOSES ONLY. Tramadol Drops provide tramadol in a format suitable for patients who experience difficulty swallowing pills. Tramadol Drops may be prescribed for children older than 12 years. Zydol is tramadol hydrochloride provided in a wide range of doses from 50mg to 400mg and in various formulations including soluble tablets, capsules, and slow or extended release tablets. Zamadol is a proprietary tramadol formulation available in 50mg melt tabs or in 24hr slow-release tablets in 150mg, 200mg, 300mg or 400mg doses. Mabron is a proprietary tramadol formulation available in prolonged release tablet form and in strengths of 100mg, 150mg and 200mg. Tramacet tablets combine 37.5mg of tramadol hydrochloride with 325mg of paracetemol. This combination of painkillers can be prescribed for patients who find paracetemol alone is not enough.